Holy Matrimony is a sacrament of the church. It is not the same thing as marriage, which is a legal entity, a union recognized by a secular authority. According to the Book of Common Prayer, however, marriage is a union “established by God in creation”, which was approved by Jesus as he “adorned this manner of life by his presence and first miracle at a wedding in Cana of Galilee” (p.423). Holy Matrimony is the sacrament in which a marriage is created by two people, is witnessed by a congregation representing the Church, and is blessed by a priest or bishop. It satisfies the definition of being a sacrament in that it “signifies to us the mystery of the union between Christ and his Church” (p.423), the couple itself being the “outward and visible sign” of this mystery. The sacrament of Holy Matrimony is available to any couple in which one of the parties is either a member of Trinity parish, a direct family member of a Trinity parishioner, or a member of another Episcopal Church in a situation whereby a wedding here might be deemed appropriate by the Rector. If one of the parties has been divorced and their former spouse is alive, permission to remarry must be obtained from the Bishop of the Diocese of Long Island. A copy of the Certificate of Divorce must be provided before any application can be sent or arrangements can be finalized. In certain cases, evidence of counseling may also be required. Interested couples should contact the Rector as far in advance of an anticipated wedding date as possible. At least 60 days’ notice is required for all weddings. The canons of the Church mandate that all couples must receive pre-marital counseling, usually called “Pre-Cana”. Normally this is completed in one session, in which the Rector will determine whether there is sufficient evidence that the couple is mature enough and understands the Christian commitment involved in Holy Matrimony. The teachings of the Church will be shared and options open to the couple will be determined at that time. While there is room for variation, the basic outline of the service must come from the Book of Common Prayer, and the wedding vows cannot be altered. The couple can choose readings, readers, music (which must be approved by both the parish organist and the Rector) and provide certain decorations. All weddings may include Holy Eucharist, and while urged, is not required. Weddings are not usually scheduled during Advent, Lent, or Holy Week. Couples must obtain a Marriage License prior to their wedding. 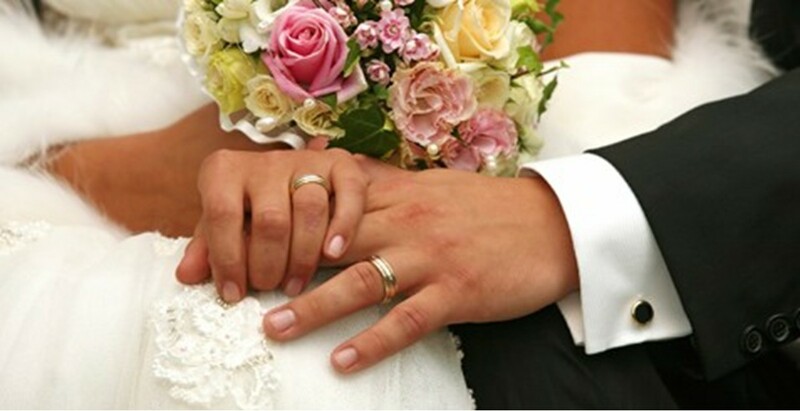 Licenses should be given to the Rector at the time of the wedding rehearsal. No wedding will take place unless a license has been received. If a couple has been joined in a civil ceremony and wishes the blessing of Holy Matrimony they must provide a copy of their Certificate of Marriage. All the usual policies apply except that no marriage license is required, there will be no questioning if people have any “lawful objections” to the couple’s union, and the words spoken by the Rector, “I pronounce that they are husband and wife” will be replaced by, “I reaffirm that they are husband and wife”. Photographers and videographers must meet with the Rector before the service to receive instructions and directions. Unity candles (aka Christ candles) may be part of the ceremony. Aisle runners are not allowed because the church aisle is carpeted and a runner can create a tripping hazard. Flower girls are not permitted to throw flowers inside the church. Outside the church the throwing of rice is preferred over bird seed, although bird seed is allowed. Confetti is not allowed. Parking in front of the church will be reserved for up to three limousines. Additional parking for guests is available at the end of Main Street and along the streets surrounding the church. The consumption of alcohol on church grounds prior to or immediately following the wedding is not permitted. No wedding will continue if either party appears impaired.